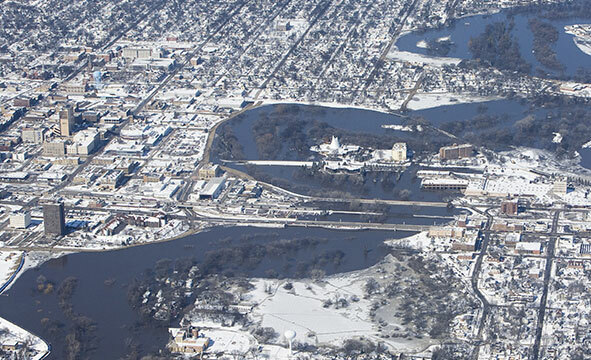 St. Paul, Minn. — On Nov. 13, the Minnesota Department of Natural Resources (DNR) issued a Final Supplemental Environmental Impact Statement (Final SEIS) for the Fargo-Moorhead Flood Risk Management project. The Final SEIS describes the potential environmental and social effects of the revised Fargo-Moorhead flood diversion project, known as Plan B. The DNR received 107 comment submittals on the Draft SEIS, which included letters, emails, and transcribed comments from a public meeting held Sept. 13 in Moorhead. The DNR used those comments to make revisions and produce the Final SEIS. The Final SEIS also includes all comments that were received and responses to substantive comments. Broadly speaking, the Final SEIS describes the proposed project, identifies potential environmental impacts and considers mitigation and alternatives that may lessen the environmental impacts. The supplemental review, which is not an entire new EIS, focused on those aspects of the revised project that were not fully evaluated in the original Environmental Impact Statement (EIS). The EIS covered the potentially significant issues and alternatives raised in scoping. The EIS provided responses to substantive comments received on the Draft SEIS. The EIS was prepared in compliance with the environmental review procedures established in state law. To inform the DNR’s adequacy determination, public comments on the Final SEIS should focus on these three criteria for adequacy. If the Final SEIS is determined adequate, the environmental review process for the Fargo-Moorhead project will be complete. The DNR would then proceed to making final decisions on the dam safety/public waters work application for the project. Notification of Final SEIS availability is in the Nov. 13, 2018 Environmental Quality Board (EQB) Monitor. Additionally, anyone who submitted comments will receive an individual notification that the Final SEIS is available. The Final SEIS and additional details about the proposed project and the DNR’s review process are available at www.dnr.state.mn.us/input/environmentalreview/fm_flood_risk/index.html.